President Kagame speaks at a “High-Level Lunch on Digital Transformation in Africa” on the sidelines of the 32nd Ordinary Session of the African Union in Addis Ababa. 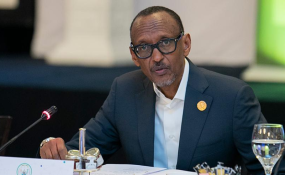 President Paul Kagame Monday morning chaired a Smart Africa Board meeting on the sidelines of the just-concluded 32nd African Union Summit in Addis Ababa, Ethiopia. At the meeting, Lacina Kone, an Ivorian national was appointed new Executive Director of the Smart Africa Secretariat, replacing Dr. Hamadoun Touré who completed his three-year term. Prior to the appointment, Kone was serving as the Director General of Qualicom, a firm involved in integration of IT solutions with presence in the West African countries of Mali and Côte d'Ivoire. Kagame thanked Toure for his efforts at the secretariat over the last three year saying that the organization had grown during his tenure. The alliance is a framework for implementation, monitoring and evaluation of the SMART Africa Manifesto, designed to make it actionable. Currently, the Alliance is a partnership bringing together all African countries adhering to the Manifesto represented by the AU, the ITU, World Bank, AfDB, ECA, the GSMA, ICANN and the Private Sector. It has grown to 24 member states with a total market of over 600 million people. The alliance also has corporate members from the private sector as well as international organizations including the African Development Bank. The meeting was also attended by the International Telecommunications Union Secretary-General Houlin Zhao and the President of Estonia Kersti Kaljulaid. Kagame said that with Estonia being a leading country in IT and technology there were lessons to be learnt from their model of development.